Any truck girls out there? 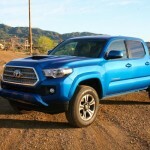 Well, I wasn’t until I got in the driver’s seat of the 2016 Toyota Tacoma TRD Sport. Listen, when they told me I’d be driving a truck, I hesitated for a day or two, composing a message that kindly rejected the offer. But I like challenges and getting outside of my comfort zone. So I accepted. As soon as I saw this blue beauty, my heart fluttered with excitement. I think I let out a little squeal. I thought, this will be my power ride for the week. I’m going to defy the truck culture and drive this like a boss. And, honey, I did that. 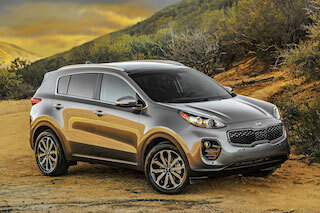 Personally, This car speaks to that power and fearlessness women have. It shows the boys that we can play in the sand too! Or maybe it’s just a fun car to drive and every women should try it at some point. I digress. 1. Big toys for Boss Ladies – Okay, one thing that seems intimidating about trucks is that they’re just too big and too high for any reasonable person. 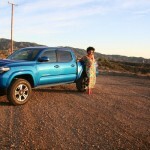 The Tacoma is big and high, but not unmanageable and overbearing. Adding a little step to hoist yourself into the car would be helpful but other than that, the size is perfect. Plus, I was at eye level with all the men who were driving trucks out there in the world. It was especially tickling to notice them notice me, or the truck, or the combo of me and the truck. 2. Confidence booster – This may sound a little ridiculous, but what I mean is the safety factor. For many, feeling safe in a vehicle is important. You know those moments when two big rigs come up beside you and you feel trapped with no where to go? 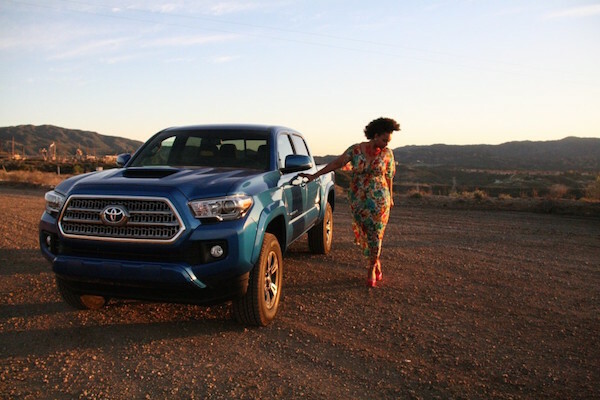 The Tacoma brings confidence to the road, helping the driver own the space she’s in. 3. Looks good on ya – Pick up trucks typically go unnoticed for me. They’re not particularly attractive or even a part of my car canvas but this cutie has all the looks. 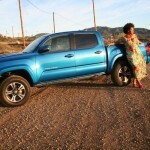 If cars had genders, the Tacoma would be a girl– a body builder girl. She’s tall, strong and still has good looks. I’d consider even pulling up to the valet at an evening ball with her. I did a whole photo-shoot with it (below). 4. Moves along, but takes her time – One thing I wasn’t so excited about was the truck’s lack of speed. Uphill climbing seemed like a struggle, like not doing cardio for a month and trying to hike a mountain. Often I had to move to the slow lane for the faster traffic to push on past. 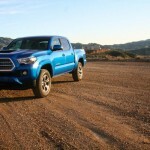 Plus, the Tacoma, I noticed, isn’t particularly conservative with the gas, though it isn’t a gas guzzler either. So going uphill and pushing on that gas isn’t ideal when trying to conserve a little. 5. 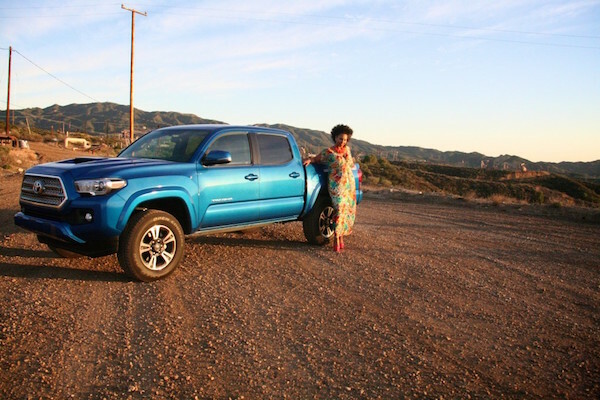 Ratchet music worthy – The Tacoma is the type of car that you can play your music loud in. Plus, you can secretly dance with the windows up and shades closed. I don’t know what had come over me, but this truck inspired boldness and freedom. The TRD is equipped with a Sirius XM radio subscription. I found some stations that only sounded good when played loud. Good thing the sound system was pitch perfect. The bass was on point. 6. Bring just your best friend – The Tacoma doesn’t have a lot of passenger space. Although it is a four-door vehicle, the backseat is really for your purse and your best friend’s bag. Or a car-seat, depending on your priorities in life. 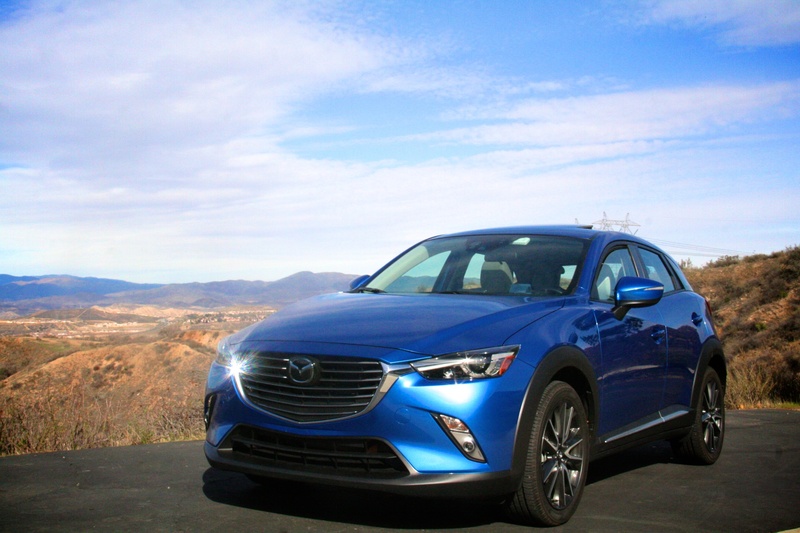 The front passenger experience is even better than a sedan. My passengers were chillin’, cool, comfy, and confident. It’s the spirit of the truck, I’m telling you, but it’s an experience you only want to share with someone who can appreciate being a Boss like you. Favorite Feature: Beauty versus brawn. It was fun being a girly-girl in a manly-man’s truck.